Among the many questions which I ask myself, none occupies me more than the riddle, that the evolving human being, proud and spirited in his progress, turns away from God in such great number. It is disconcerting that in our time of such great progress in various area, we face, like an infectious disease, an insidiously spreading violation and denial of God. Why is the image of God so obscured that so many are no longer moved by it? Is the failure only on their side? Or is there something asked of us to make it shine brightly again over the world and might we hope that a study of the concept of God will at least alleviate this greatest of all needs? I do not imagine, in the space of one hour, to find a solution to this world problem, greater than that of material need. I want to share only some thoughts which this question evokes in me, in the quiet hope that the posing of this question in this place will benefit Catholic learning, not because of the answer I give to it, but because this incomplete and imperfect answer will bring others to a better and more complete one, thus one of the most vital questions, too little reflected upon, will find the attention proportionate to its significance, for the alleviation of the need and for the advancement of true progress. We live in a time of great confusion in the realm of thought. The most contradictory systems are held as truth and defended with passion by recognized scholars. But I see the most awful chasm in the thoughts concerning God. Next to the great, fortunately still overwhelmingly great majority which holds a very specific idea of God and worships him with reverence, are - the press and statistics put it bluntly - hundreds of thousands, nay, millions, I shudder to name such large numbers, but there are millions who no longer see any basis for their concept of God and, not satisfied with denying his existence, wage a battle full of passion and hatred to efface every thought of God from society. It is not my intention to defend the concept of God, there is too much apologetics. All too often we walk the negative way of defence and rebuttal, whilst it is nobler and more useful to make the truth shine forth, in a positive way, in the light which emanates from it and always appeals to the human spirit. So, I believe that we have the task, must consider it an honourable duty, to look around us at this phenomenon of the denial of God, not in the first place to set ourselves up in opposition to it, but taking it into account, to make known the concept of God under new forms, in this sense to adapt it to present-day culture, which from the richness of this concept especially brings to the fore that glory, which for this time of that concept of God, emanates the most appeal. Despite the great progress in many areas, the human mind must be terribly dazzled that it no longer has the capacity to see God. This obstruction of vision, however, is not a total blindness. And without ignoring that this defective vision results from an ailing mentality which has clouded the eye, I ask myself if the object to be viewed is placed sufficiently in the light and whether we should not try to illuminate and place it so that even, through this ailing defective vision, it will be seen again? When we ask ourselves which representation of God leads and governs the minds in society today, then it almost looks as if the question cannot be answered. There is so little unity in the realm of thought, that in the first instance we think that we have to allow an endless row of images to pass before our eyes, one after the other. Whenever we want to immerse ourselves in detail, then this would indeed be necessary, but it is not about that here. However great the confusion and contrast might be, there are nevertheless tendencies, there are still trends in the development of thought which, in broad lines, have determined the course of the image of God throughout history and also at this point in time convey to us in broad outline what is playing out in the foreground in the current image of God, what in that is particularly being overlooked. When we survey this, we are already forced to some degree to perceive, on the one hand, which image of God will be born from that constellation of thought, on the other hand, which concept of God leads human nature in the right direction and, when we take into account the trends of the times, ought to count for us as the most apt to attract and inspire mankind. Then it occurs to me, that we, who love God and would gladly see Him adored and glorified by all, must above all emphasize the following elements in our rich image of God, in order to arrive at an image adapted to these times. We must first and foremost see God as the deepest ground of our being, concealed in the innermost part of our nature, but there nevertheless to be seen and contemplated, after first reasoning, clearly to be known, by means of regular disposition towards it, without repeated reasoning and as by intuition, so that we see ourselves in God’s unremitting gaze, and not only venerate Him in our own being but also in everything which exists, first and foremost in our fellow human beings, but then also in nature, in the cosmos, omnipresent and pervading everything with the work of his hands. This indwelling and inworking of God should not only be the object of intuition, but reveal itself in our lives, finding expression in our words and deeds, emanating out of the whole of our being and all that we do. This natural image of God, the best adapted to the philosophical currents of this time, is powerfully strengthened when, in the supernatural image of God which we have come to know through Revelation, we also bring to the fore those elements which, in that, most accord with the above mentioned, and either define this or make it clearer. Then I think of the delineation of the work of grace, of the exposition by experienced theologians of what is understood by grace, and further of the practice of the three theological virtues which, by way of heroic practice, so gloriously beautiful, demonstrate and make distinguishable both the work of grace and the divine element in every being. Where faith and hope and love are put into practice in the most heroic way as virtues, there we sense the Divine close-by, there God approaches us, as it were, out of the practitioner of virtuousness and everyone who sees this shall fall under the spell of this divine aura. There is in these dark times still a redeeming feature in the gradual preparation and development of the concept of God. Among the many which so endear the concept of God to us, there is surely hardly an element to point to which thereby brings such great appeal as the idea, that God dwells within us, that we have the means to discover and to abstractly contemplate Him in ourselves, and with us in everything that surrounds us, whilst in the whole of our life that divine indwelling can become a bright radiance. That the development of philosophical thought, that is the guide of life, brings forth this element in such a special way and, in spite of the will of many persons who have gone astray from God, that the need of the times leads to his contemplation under the most beautiful forms, is to be appreciated as a ray of light in the dark night and to be seen as a joyful perspective. Religion is, in this strife for God, irrefutably deepened and interiorized. And it is to no small extent gratifying, that out of this strife of thought, this beautiful image of God appears to be awakened to new life. I am not saying that it is born out of this strife. It is not new, but nevertheless there is new life and that new life may be a reflection of representations of God in former centuries. In each time, such an image, which in different eras has come to the fore, has a particular colour, for most part inessentials, a collection perhaps at most, but if according to the French sage the tone marks the music, then here there is a new chord, in which the particular tone can be heard and the particular tone gives the chord very special charm. The pragmatic-intuitive character of the image of God does not in the slightest reveal itself in the great desertion from God, greater than in any other age. It demonstrates at the same time, how many do not understand under which forms people now particularly search for God and so many do not find Him. The Great War has contributed its share to this and one of the most disastrous consequences of it is certainly this denial of God. Our pragmatically oriented spirit of the age searches for the revelation of God, thinking that God can only be found in works, performed by people, not through one or other person, but through people in community, revelation of human nature. Here a comparison could be made with what took place at the start of the sixteenth-century, when millions turned away from the Catholic Church, but besides points of agreement there are very great points of difference which, in order to tease out, would mean us having to stay too long with this image. We might say, that now the dissatisfaction is much much greater, the reverberation is then all the more radical. The attitude of mind was in that time also much less pragmatic. This latter character of truth now shows itself in such a particular way, that the gross injustice which occurs in the world, and are presented as self-evident and corresponding with nature, thousands are prevented from seeing God in nature. The intuitive alogical and irrational character ascribed to human thinking, cultivates in the person aversion to reasoning of the facts, to explaining what is being played out. It demands such a clear image, that it imposes itself on the mind as irresistible and overwhelming. And with the current conditions it costs effort, and reasoning belongs to it, to actually see everything arising from God, led to see by God. Where human thinking is so orientated, one can surely speak of a sickly mentality, but that does not exempt the worshippers and lovers of God from the obligation to reckon with this when they desire to spread the idea of God, and once again get it accepted. And then we experience what is claimed in the current image of God and is insufficiently seen in there. Then we see that this time of alogical intuition is not even satisfied by an ordinary practice of virtuousness, but then we should ask God, for this time, to raise up men and women of heroic virtue, who through their deed compel the cry: Disbelief is no match for this. Then something must emanate from this concept of God on society, and one ought not disappointedly turn away from those who confess God with words but deny with the deed. Fortunately, this is more and more understood. There appears, especially amongst young people, a youthful enthusiasm to confess belief in God proudly and openly in deeds and to make him known in his beauty, in his inspiration towards the good deed. However, it is not sufficient to urge on practical experience of faith in God and to urge it on in ourselves, more is necessary. We must understand the time and not place ourselves outside of its influence. We are also a child of the times. Let us be that with clear consciousness and allow the good stimuli freely to act on us. The concept of God of this time has, in addition to the pragmatic, yet an intuitive character. We must make use of the favorable circumstances and teach the intuitive human being to see God where He is not hidden from our eyes, at most is concealed, where our intellect can reach Him as an object of contemplation. Do not misunderstand me. I am not defending intuition for the concept of God and I am not recalling the time of ontologism, but habit becomes second nature, and many accept as intuition what has become the result of unconscious reasoning. Although we reason, our faculty of abstraction does not remain unemployed in that, and although we distinguish between reason and understanding, both bring us to understanding, to an act of seeing, from which often with nothing than the greatest difficulty and the deepest reflection, we understand the way which brought us there. So we ought to be careful with the word intuition, certainly there where it concerns our contemplation of God, but from the other side we must not be too afraid of those people who speak of it yet, through too little introspection, take for intuition what has become nothing than the result of a normal reasoning that has become unconscious, and an abstraction controlled and managed by it. What I therefore defend and consider necessary for these times is the consideration of all that is, in its dependence and its origin from God, whose work we ought to see in there, whose being we ought to distinguish in there, who we ought to recognise and venerate in there, first and foremost in our self. God is there, and He reveals Himself to us there. He wants to be seen and acknowledged there. He is, after all, nowhere better knowable for us than in the ground of our being. If the idea of God’s indwelling, of the total dependence of the whole of nature on God, of God’s guidance and revelation in all things, were alive, what other deeds would be done in order to make them consistent with their character of God’s revelation. People must again see God and live in the contemplation of God. This is called mysticism. So be it. I can even applaud that, when I am allowed to see in it the expression of the truth that we have to see in mysticism the further and higher development of that which is potentially laid down in human nature, be it then, that the realization of this potentiality cannot take place than through particular divine blessing. It is not in the least in conflict with nature, on the contrary, nature is called to see God as the most precious object of its knowledge. It is unfortunate enough that this is no longer understood. The mystical works of a Ruusbroec in the literature from our own country would be able to teach us again how we, still working with the natural gift of intellect, can arrive at an always clearer contemplation of God. It is a reason for great joy in these times that the mystical works are in vogue, that people again consult them to learn from them contemplation of God, to receive from them the image of God which is the most needed for this time. From the intuition of God in the innermost depths of all being the inspiration then easily follows, which should then translate into deed. We view it with joy, how many, especially young people, in holy zeal, led by God, who they worship in themselves, with whom through grace they know themselves to be inwardly connected, whose union they still affirm and strengthen through their daily Holy Communion, drawing out of their unity with God the inspiration for deeds of service. It must be about this. The good deed is no longer enough, it must arise out of the awareness that our union with God binds us to this. This awareness should become the strong underlying motive for an act. But from the other side, neither is faith in God sufficient and this must be seen as living in works and therein lay bare its value. The image of God sketched here is thus a powerful idea, which shall not only find ready acceptance beside the vague and hazy representations of God, which still survive in the mind of so many, but also once acquired and assimilated shall withstand much strife and resistance. 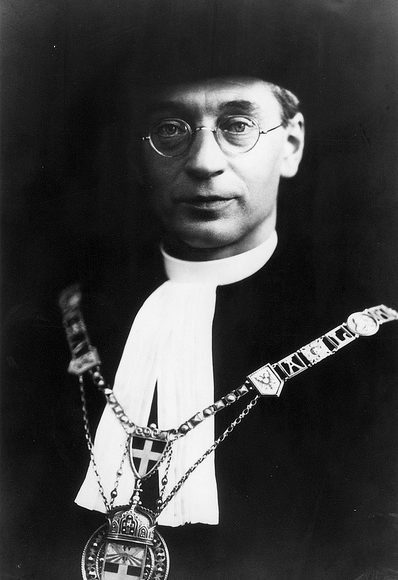 ↑ Fragments from: Titus Brandsma, Godsbegrip, Nijmegen-Utrecht 1932.